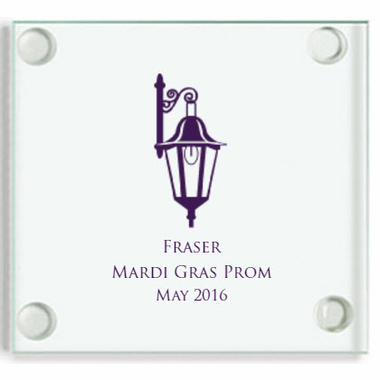 Accent your New Orleans theme party with simple but effective custom glass coasters, specially designed for your celebration. 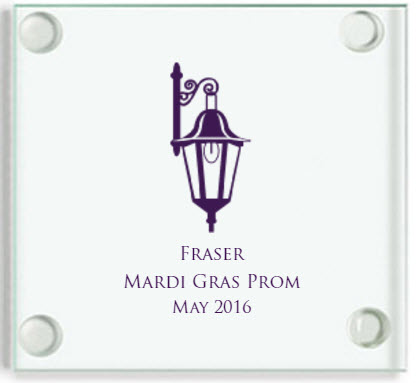 Each elegant glass coaster is directly silk-screen printed with the image of a lamp and may further be personalized with the event details. Pack each favor into white boxes at $.50 each and add the finishing touches with a peel and stick bow. Each square glass coaster measures 3.5 inches and has rubber feet so it won't slip. Coasters come bulk packed.